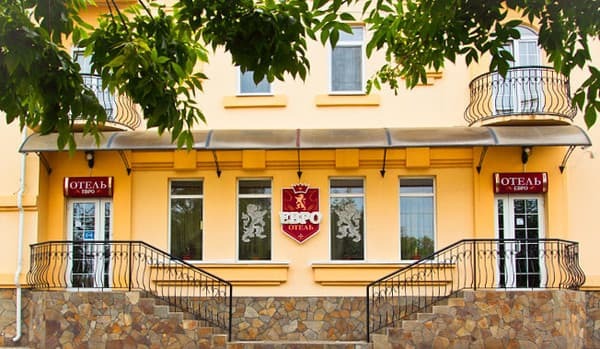 Hotel "Euro" is a modern hotel complex, which is located in the central part of Berdyansk. To the central beach 7-10 min. Walk. The hotel offers a wide range of rooms, so that every visitor can choose a comfortable apartment. Each floor of the hotel is decorated in an individual modern design. The hotel has a guarded parking lot; conference hall; Free Wi-Fi is available throughout the hotel; Laundry (washing and ironing services are offered). Guests can also use the safe, which is located at the hotel receptionist where you can store important documents, money or other things. In walking distance to the hotel there are cafes and restaurants. 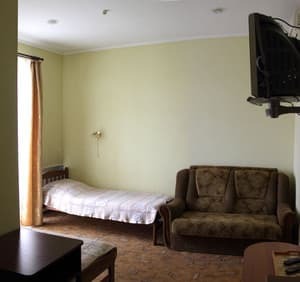 In walking distance from the hotel "Euro" is located Primorsky Square with its famous monuments, close to the sea, clubs, cafes, a cinema, banks. Description of the room: The room has two beds and a sofa bed that can be used as a bed. Description of the room: The room has a large double bed and a sofa which can serve as an extra bed. 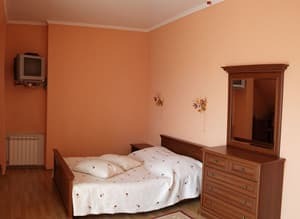 Description of the room: The room has a large double bed. There is also a separate work area. Description of the room: The room has a large double bed, as well as a sofa bed, where an adult or a child can relax. Понравилось абсолютно все!!!! Номер просторный и очень уютный. Чисто. Все необходимое есть. Приветливый персонал. Рекомендую!!!! Нет ничего, что не понравилось. Проживали в номере люкс. Он оказался очень просторным, с рабочим местом, барной стойкой, балконом, большой ванной. Все чисто, красиво и уютно. Шумно, очень хорошая слышимость происходящего на улице (но это при открытом окне), и, что хуже, очень хорошо слышно беготню детей в коридоре и соседнем номере, мешало отдыху. Приветливый персонал, охраняемая стоянка, уютные номера! Пульт от кондиционера нужно брать у администратора. Чисто. Вкусная еда. Ежедневная уборка. Комфортно. The cost of additional space is 150 UAH. Children under 10 years of age are offered a separate bed for a price of 70 UAH. In walking distance from the hotel there are cafes and restaurants. The hotel can use its own multivark. 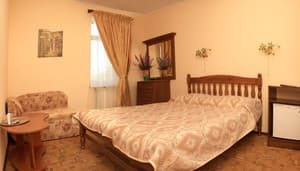 The hotel "Euro" is located in the central part of the city of Berdyansk on Shevchenko St., 22. In walking distance is the Primorsky Square. From the railway station by bus number 17 or number 5 to the stop "Sanstanstia".